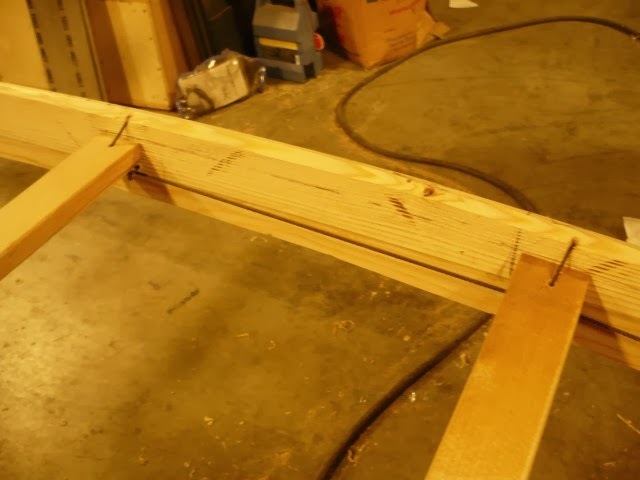 In the previous post we looked at cutting and installing all the deck beams. I chose to temporarily nail them in place. While the method I chose is not traditional for this type of boat, it works well enough and is quick. The Eastern Arctic method is one of digging shallow divots in the sides of the gunwales and pointing the ends of the deck beams to fit into the divots. See the Zimmerly Sea Kayaker Article for details on how this works. The main advantage of this approach is that if you don't have steel tools, it is an easier way to do the joinery since it doesn't require as much precise cutting. 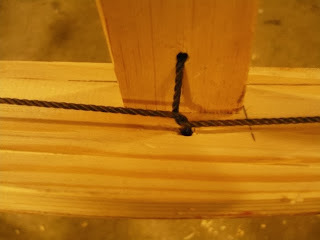 The lashing which comes next holds the ends of the deck beams in their divots. This method was also apparently used in Greenland until contact with whalers made steel available to them. East Greenlanders also used the divot method. 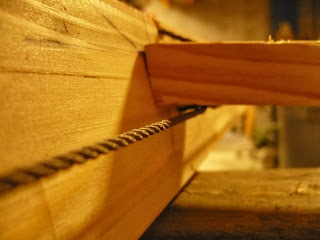 The following photos show some details of my hybrid approach of doweled deck beams and traditional running lashing. Doing lashings like everything else in kayak constructions can be done in a number of different ways. Aside from the lashing patterns themselves there is also the local vs. the running lashing approach. Running lashings seem to be favored where the lashing material is rawhide. 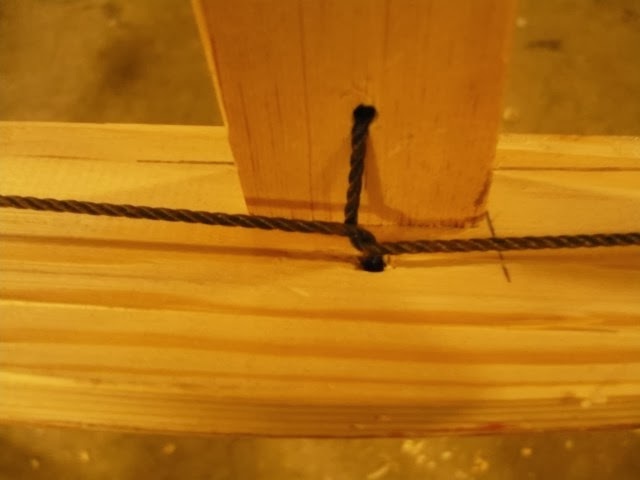 Where string was available, lashings were more likely to be tied off at each joint. Another factor in the decision of which way to go was the strength of the lashing material. 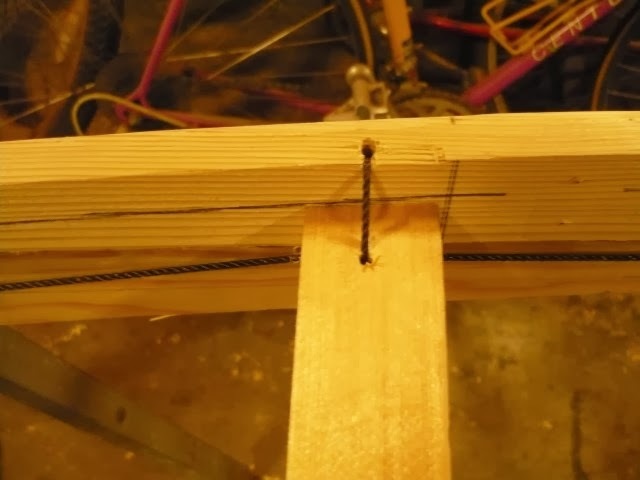 Weaker string would take multiple turns at each joint which favors tying off the string. Running lashings favor a stronger binding medium like rawhide since a break of the lashing anywhere along its length would make the whole run unravel. This lashing runs left to right. 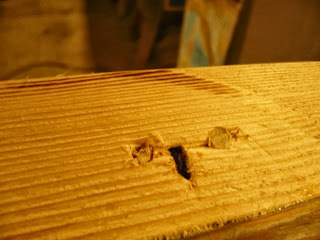 The string goes into a hole in the gunwales under the deckbeam to the outside of the gunwale. Then it goes up in another hole in the gunwale and exits at the top of the gunwale. Next it goes through the deck beam, loops around the string coming in at the left and heads off on the right. This shot shows the lashing moving from deck beam to deck beam. The lashing material is tarred seine twine a little under an eighth of an inch in diameter running through 3/16th inch holes. The tarred seine twine is stiff enough so that it can be pushed through the holes without the need to additional tools. A view from the outside showing both the dowels and the lashing coming out of the gunwale at the bottom and then heading right in again above. Note that one of the downsides of dowels and this lashing scheme is that you have to be careful not to drill through the dowels when making the lashing holes. A view of the lashings from below the deck beam. The lashing makes its way through the gunwales and comes back again, taking off to the right after looping around its incoming arm from the left. And finally, a side view of the arrangement. Note that the deck beams sits about 3/4 of an inch below the top of the gunwale.